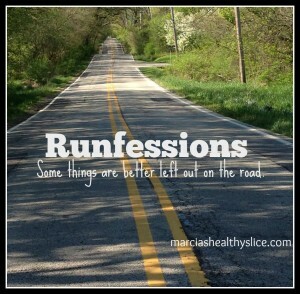 I haven’t had too many runfessions lately, but I think it’s time to join up with Marcia’s Healthy Slice and give it a go. It’s been a hot hot hot summer, and it’s shown up in the slowness of my miles. My runfession is that the slowdown hasn’t really bothered me as much as I thought it would. After all, I can close the books on August with about 94 miles for the month and 699 for the year so far. That’s nothing to be ashamed of, and I actually feel like I have been enjoying my runs much more than in the past. I am really glad to have a new gym in our neighborhood. I runfess that I have only been one time since it opened, but my runfession is that I have been a super slacker with my cross training. I don’t know how much it’s negatively affected my performance, but I need to be better about not neglecting the other parts of my body to focus on running. I was thunder and lightning-ed out of a run the other day so I sucked it up and got on a treadmill. Usually, I despise the treadmill, but for some reason, this one was ok. I didn’t have any pain or discomfort in my hips at all (usually, I get some kind of jangling feeling that last with me for a few days), and even with the hill interval setting and a few extra miles, I was able to run straight through without my Galloway intervals. I’ll try it again. I’ve struggled with blogging lately. I love this blog and I love writing but I have been spread very thin and sometimes it’s just so hard to sit down and make it happen, especially when I’m writing and doing social media on contract. I commit to be better and to manage my time properly so I can continue my writing here. I’m so with you on feeling spread too thin and not blogging as much. I’m hoping to get back into more of a routine in the fall. You’ve done a great job of running in this summer’s heat – great mileage! Thanks! I’m really proud of how my miles have been going! That’s awesome that you have a new gym in your neighborhood! Congrats on your mileage this month. You did awesome for dealing with oppressive heat and humidity all month! I love the gym. It had a lot of pushback, and it’s not huge, but it’s nice to have somewhere to go for weights and machines that doesn’t cost anything over my usual HOA fees and is right around the corner. I definitely can’t see using it unless I have to. But it’s nice to know that it doesn’t have to be disastrously terrible. Yes, definitely a hot summer and that made training very tough. There have definitely been days where the mill is the better option for me. I feel you on blogging. It’s so hard to keep all the balls in the air sometimes. Thanks for linking! I’m great at juggling, until I’m not. This is one of those not times. But I’ll get back in gear. Sometimes, I just have to take a step back to catch my breath and then it all works out. Our summer weather has been all over the place – from fall-cool to stiffling. While the cool breaks were nice, it made it hard to acclimate to the humidity when it came back. I feel you on the blogging. I spend all day at the computer for work and sometimes it’s hard to face the screen again at home! I would absolutely love a fall cool day. We don’t even get those in the actual fall, usually, so that’s kind of a bummer. This has been one of the hottest summers that I can remember here in Maine! Looking forward to Fall running!! I don’t know if it’s been the hottest here, but in the moment, it sure does feel like it. I am ready for some fall temps! I love summer, but it was a hot one! I hear ya about blogging! I feel SO behind in my blogging and social media posts/replies. I always think I have more time then I do, and then I am worn out at the end of the day. I commit to being better about it also! I sit down with my phone sometimes and just get lost in Candy Crush when I should be working on social media. It’s ok. We all need to take some breathing room sometimes. I almost got on the mill today. But instead, I sucked it up and ran in the rain. It was great! Who knew? I totally feel you about being spread too thin. Now that my son is off to college, I can get back to blogging regularly. August was a bit much for me! I would have run in the rain, but the lightning was pretty dang close. I have one more busy week getting back to Scouts, plus I also took on a new contract position, so that’s another thing on my plate. It will all balance. Eventually. Almost 700 miles this year!?!? Oh man–great job with your mileage! I’m glad you’ve been enjoying your runs! I really need to work on my consistency because it’s fallen to an all-time low lately (it tends to do this whenever I’m working in the hospital :[ ). Best of luck to you with blogging! I have spells where I don’t feel like writing even though I love to write. I think sometimes just taking a break to live life and do other things helps to re-energize me! Some weeks it is harder to get up and out but I am trying to keep my eye on the end game. The blogging thing will be ok. I just need to remember that I love this space and I love writing and the words will flow again. I go through phases like this from time to time and it always works out. No shame in hitting the treadmill. sometimes it is a necessary evil even in the summer! Nope. It’s not my preferred method but at least I was about to get that run in. I runfess that I wimped out of this morning’s run. It was already 78 with 98% humidity and I was like… NOPE! But I’ll make it up tonight on the ‘mill. Ick.